・Guests under the age of 20 will not be admitted. ・Guests must show valid photo ID(*1) to enter the festival. ・Guests without valid photo ID will be denied admission without refund. (*1) Driver’s License, Passport, Social Security Card, Basic Resident Registration Card, Special Permanent Resident Certificate or Alien Registration Card are valid forms of photo ID. [General Policies] PLEASE READ CAREFULLY. ・Once a ticket has been purchased, cancellations, changes, and refunds for one-day, two-day, and three-day tickets because of artist schedules will not be provided under any circumstances. 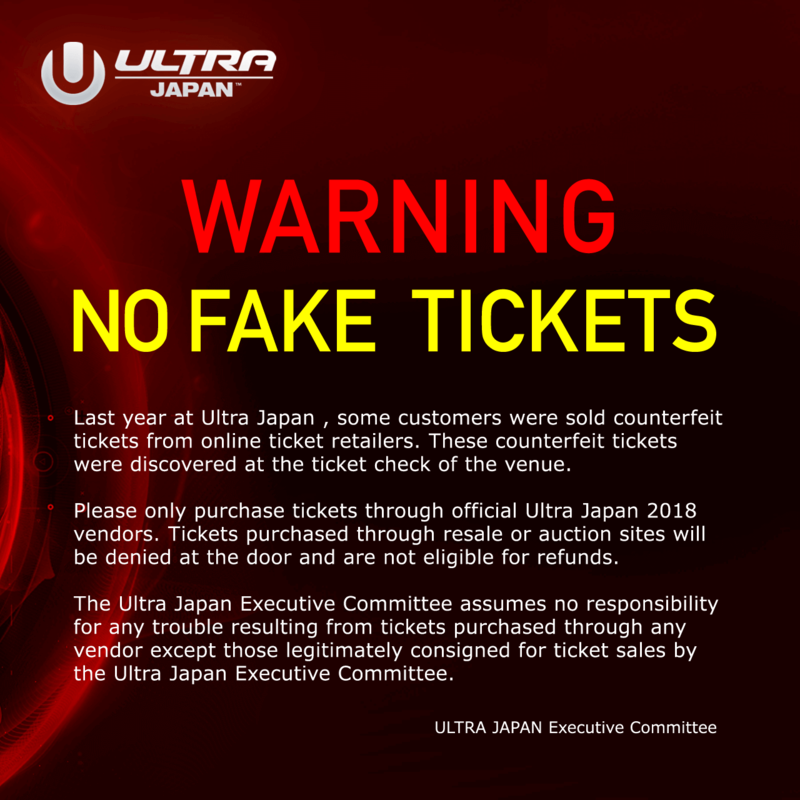 ・Once a ticket has been exchanged for a wristband, refunds, re-issuance, and re-entry will not be provided for any wristbands that are lost or destroyed. ・Please note that there may be entry restrictions at each stage. ・This event is to be held as a clean party that everyone can enjoy. ・Because this event will feature multiple artists, sudden changes or cancellations can potentially occur. Refunds will not be granted in the event of such occurrences. ・The refunding of travel expenses (including cancellation fees) will not be guaranteed in instances in which the event is canceled or postponed. ・Attendees will not be allowed to bring beverages or alcohol into the event. ・Umbrellas, coolers, chairs, parasols, mats, bottles, cans, fireworks/explosives, animals (guide dogs) and other dangerous or illegal objects will not be allowed inside the venue. ・The possession and use of hazardous materials, drugs, or illegal objects in the venue is strictly prohibited. Authorities will be notified if any of these items are discovered on your person during entry. ・Attendees are responsible for their own personal possessions. ・The venue, organizers, and artists will under no circumstances be held responsible for any accident, theft, injury, or loss that occurs inside or outside the venue during the event. ・Information on customers received during ticket reservation or purchase will belong to the organizers of the event. ・Waiting all night around the venue causes trouble for local residents and businesses and is strictly prohibited. ・No parking is available at the venue, so attendees should use public transportation to go there. ・Movie and still cameras will film and take pictures during the event. The organizers may use any of this footage/film for publicity at their own discretion. ・The transfer or resale of tickets for profit is strictly prohibited under the agreement established by the National Concert Tour Operators Association (Chapter 4 – Article 15). Tickets purchased between individuals, on auction sites, or at voucher shops are not guaranteed to be valid for entry into the event. If the transfer or resale of tickets is discovered at the venue, those attendees with be barred entry and legal action will be taken. Any problems caused by the transfer or resale of tickets during the event are to be resolved between the concerned parties. ・Anyone recognized to be involved in criminal organizations or other such groups will be denied entry into the event. ・Anyone who engages in behavior contrary to the spirit of the event, is involved in fights or other violent activities that disrupt the event, or refuses to obey the instructions of the staff will be forcibly removed from the premises. Anyone removed in this way will not be allowed re-entry into the event under any circumstances. ・If unauthorized entry is discovered, the attendee will be forcibly removed, turned over to authorities, and asked to pay restitution. ・Anyone not deemed to be in line with the spirit of the event, venue, or its performances will be prohibited from entering. If anyone is not deemed to be behaving in line with the spirit of the event, venue, or its performances after entry, they will be forcibly removed from the premises. ・Anyone forcibly removed or denied entry for the above reasons will not receive refunds under any circumstances. ・Please note that the above can also apply to persons accompanying valid ticket purchasers.